The Wedding Cake – Wooooooooooo Hooooooooooooo! At last. I made a cake. It didn’t fall apart. It looked respectable. I fed it to my colleagues and they thought it tasted fab. Yay!!! Well done! You must be very proud (and your friend must be very relieved!). Wendy, I admire your steely character in sticking to the job at hand. Finally, it looks like a cake and the wedding guests will OOH & AHH at it. SO happy for you 🙂 WOOOOO and indeed HOOOOOOOOO! Helen – Thanks! 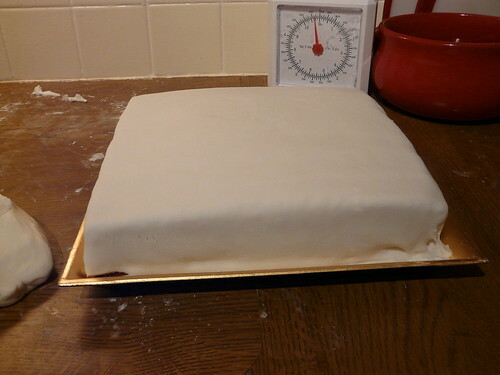 Think I may have to make the icing a little thicker for the actual cake as all the lumps and bumps were very obvious. Shame, as I agree with you. Peter – Thank you. Glad success came when it did as I was getting really frustrated! Jane – On their way. Thank you!!! Phew! You deserve a big glass of wine! Hi! It’s the first time I come to visit your blog and I find it amazing..really nice. If I show you the photos of the wedding cake I’ve tried once to do..you scream!! Really looking forward for your new posts! Yay, Wendy I’m so please for you 🙂 I’ve been reading your progress from the start but havent had any constructive advice!! You have shown such commitment to making this cake. Good on you! Looking forward to seeing the final wedding cake. What a superb job! I am thrilled for you – it looks absolutely divine. Totally delicious and you clearly did a good job with that icing too – all smooth and thin and wonderful. Well done you – hope you have your feet up and a nice glass of wine in hand. So pleased Wendy – my mouth waters at the sight – and it’s only breakfast time! 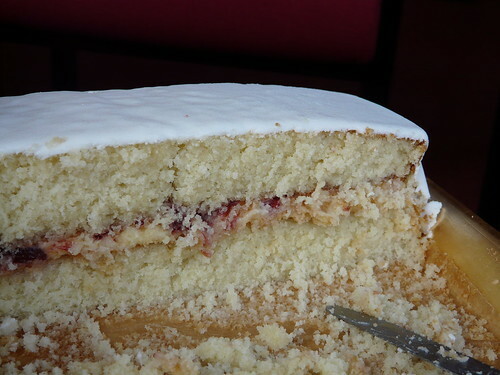 Just came upon your blog and have been following the cake journey–congratulations on this one! It looks great. (By the way, I’m over here in North America, and that paragraph from the cake bible didn’t make sense to me, either–when I bake a bigger cake, I just double everything in the original recipe!). Another tip I can add: it helps to freeze the cake before frosting it, so that it solidifies and can support the icing more easily. Once iced, just leave it out and it will all warm to room temperature. With very fragile cakes, I have frozen the cake right in the pan before even attempting to remove it from the pan–that also helps prevent cracking and breaking. Best of luck with it! Fantastic!!! that looks like a gooooood cake indeed!!!! WELL DONE!!! SOOOOOO good …. all that work – how many eggs do you think you’ve used??? Silvia – Hello and welcome! Totally understand: baking is not my strong point either. Claire – EVERYTHING has been carefully recorded. Would have been awful to forget what I did right! Antonia – Once I got over having eaten so much cake, I did manage a glass or wine or two. Celia – Did you really? I’m not used to giving up but I really was starting to think that I just was not capable of baking a cake. Hoorah! I am! Joanna – Good question… 50, I think. Perhaps I should get some hens! Time to get out the champagne, then? Well done! WELL DONE Wendy. I’ve been following your frustating journey into cake making. Frustrating for you, but so interesting for us readers. It’s rare for bloggers to talk about their kitchen disasters / problems. I would have given up by now, so I admire your resilience and persistence! Look forward to seeing the next stage. Well done Wendy!!!!! It does look yummy!!!! That’s a great looking cake. No surprise your colleagues loved it! Pretty cake! It looks delicious. Cairo says “that looks excellent for your first try” – the wee innocent! It does look absolutely gorgeous, Wendy. Well done you. Wish I had been at work too. I adore buttercream and jam. I knew you could do it 🙂 Looks marvelous! Congratulations Wendy – that’s a HUGE accomplishment. Hope you can now go on to enjoy the wedding without any stress or fuss. You have done such a good job on that cake Wendy. It is just the sort, I would love a slice of! The icing looked pretty professional too. You’ll be giving baking lessons before you know it. Next stop The Daring Bakers? Holler – The fondant icing was bought and just rolled out, must admit. Lucy – Thank you. 🙂 Fairly sure I won’t be joining those daring bakers though. It’s all too stressful! Wendy…. How fantastic the cake was, and that delight! I always visit its blog, I must very admit that taste of this space. Until more. Heidi – Thank you! You’re too sweet. I still think you did a good job with the icing! Glad you didn’t add marzipan, I hate the stuff! Yuck! Congratulations, Wendy! That is a wonderful cake, and it looks delicious, too! Hi there! Nice looking cake – I hate fruity wedding cakes! 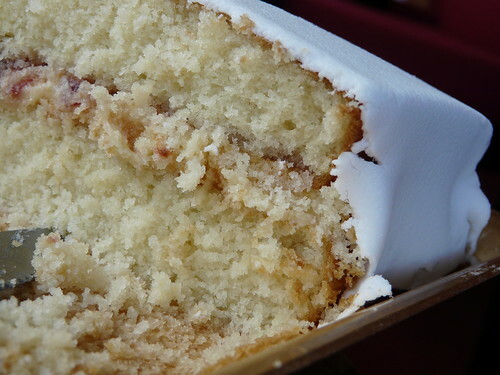 Holler – I like those wee marizpan fruits but marzipan on a cake is wrong. Agreed. Rosie – Glad someone did! I was seriously doubting I could do it for a while there. Been following the blog for a while. Glad to see you vanquished your cake nemesis.